This image made from May 21, 2014, video shows the Pyongyang University of Science and Technology. North Korea confirmed on May 3, 2017, the detention of Tony Kim, who taught accounting at the university. The family of an American held by North Korea is going public with its appeal for help. Tony Kim was detained at the Pyongyang Airport on April 22, 2017, as he was leaving the country. He was in North Korea teaching accounting at Pyongyang University of Science and Technology. In a YouTube video, Kim's eldest son, Sol, wondered whether the Winter Olympics in South Korea provided "an opportunity for the U.S. government to press harder for the release" of his father and two other Americans held by North Korea. He held up a placard with the hashtag #USA3 to raise awareness on social media. The 59-year old Tony Kim, also known as Sang-duk Kim, had been repeatedly invited to teach at the North Korean university, and traveled several other times to help flood victims, according to his family. They say they do not know why he is being held, and have not heard from him since a State Department official was in contact last June, when retrieving American student Otto Warmbier. The 22-year-old Warmbier was returned to the United States in a comatose state, and he died six days later. 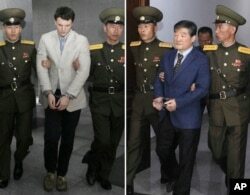 FILE - In this combination of file photos, U.S. citizens Otto Warmbier on March 16, 2016, left, and Kim Dong Chul on April 29, 2016; are escorted at court in Pyongyang, North Korea. When he went to North Korea to bring Warmbier back in June, State Department Special Representative Joseph Yun was able to visit with Kim and the other two Americans detained there, according to State Department spokeswoman Heather Nauert. She added that was the last time anyone from the U.S. or Sweden, which represents U.S. interests in Pyongyang, has been able to see the three Americans. The U.S. does not have diplomatic relations with North Korea. The other Americans being held in North Korea are Kim Hak-song, who was also working for Pyongyang University for Science and Technology when he was detained in May 2017 and Kim Dong-chul, who was arrested in October 2016 and is serving 10-years of hard labor after having apparently confessed to spying. A Kim family spokesman said, "While we cheer for our American Olympic athletes, we also want to remember that three Americans are being held only miles away."